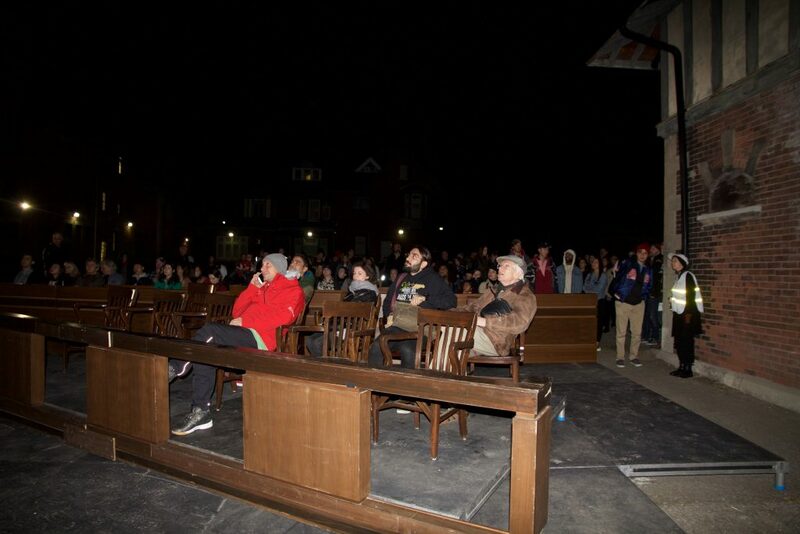 Nuit Blanche brought politics to the forefront at last weekend’s festivities on Saturday. 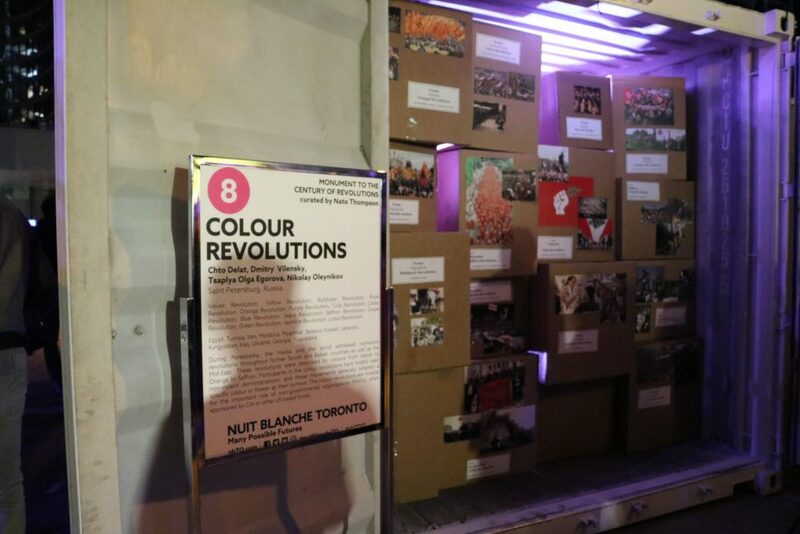 City-produced exhibitions Taking to the Streets located at Queen’s Park and Century of Revolutions located in Nathan Phillips Square were centered around politics and how audiences interact with political and social issues. Queen’s Park was transformed into a protest site for festival-goers and for artists to orchestrate. Here are the highlights of Taking to the Streets. This piece is a holographic video projection that adapts a speech by Canadian socialist William Arthur Pritchard. He was arrested in 1919 for helping to organize the Winnipeg General Strike. 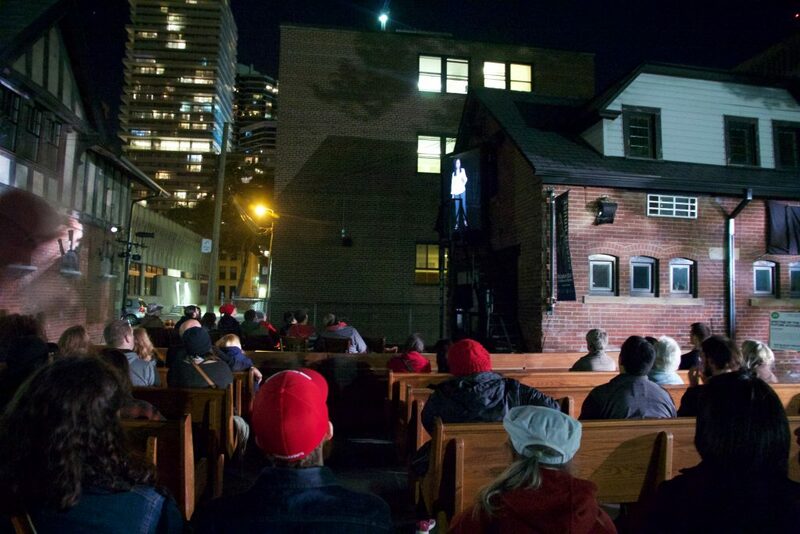 The speech is adapted and performed for an audience on the fire escape of Marshal McLuhan’s old coach house at U of T.
As seen in the photographs, there are two rows set for the jury and a number of pews set for the courtroom gallery. The jury and gallery taking in the speech. The crowd watching and listening to the chorus. This immersive video installation requires careful listening by the audience. 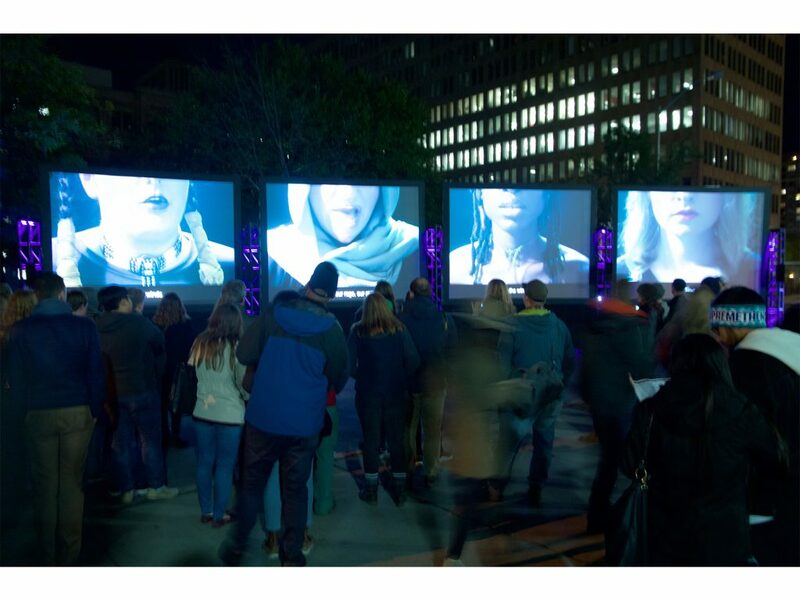 Four women are projected on four separate screens side by side. Each woman is different but the general dialogue and performance demonstrates unity. The Chorus is lead by a Muslim woman who is delivering lines in a spoken-word format. The other three women are harmonizing and singing to reflect what it is that the Muslim woman is saying. The aim of this piece is to connect the shared hopes and feelings that women have on women’s rights. 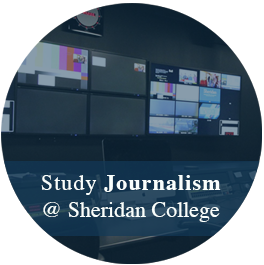 It is to amplify their collective voice of resistance and empowerment. It is a piece that leaves the audience in a trance. Music and protest with Black Lives Matter – Toronto. 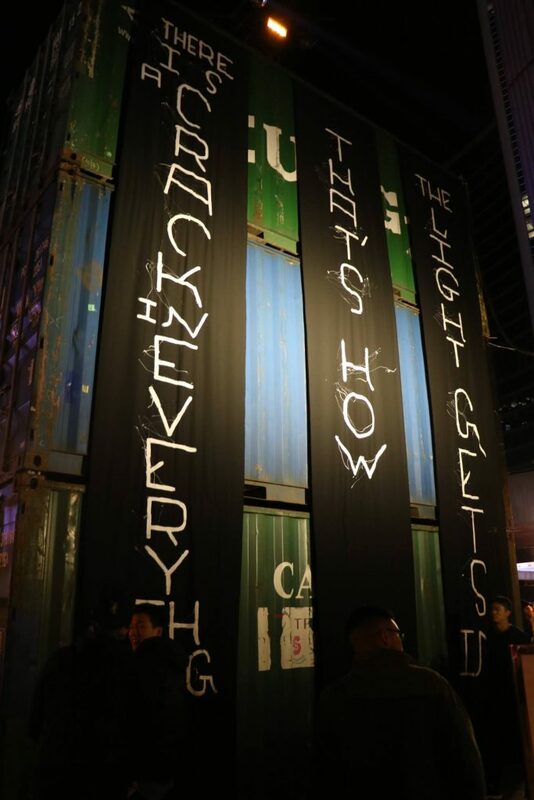 Black Lives Matter – Toronto brought the party to Queen’s Park with their installation. It is loosely based on the events of March 26, 2016 when Black Lives Matter marched from Toronto Police Headquarters and Native Child and Family Services to Queens Park. DJs are perched on top of a flatbed truck performing sets throughout the entire evening. 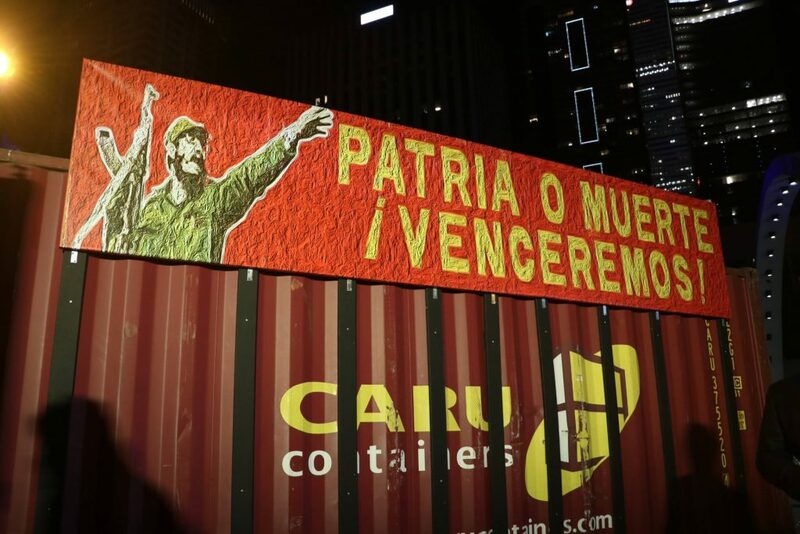 A screen mounted on the truck displays photographs from the march, their website, and their mission statement. Surrounding the stage were banners that paid tribute to people killed unjustly by police such as Jermaine Carby and Amleset Halie. Politics is often a divisive subject. However, Black Lives Matter unified a crowd of people to dance together and show support for one another. 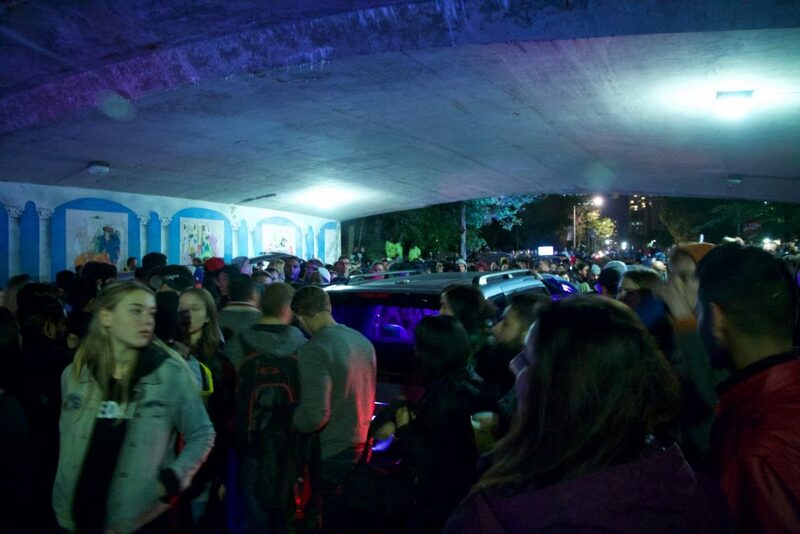 Possibly the most memorable exhibit of the night, a car meet parked under the bridge on Wellesley Street just outside of the legislative building. 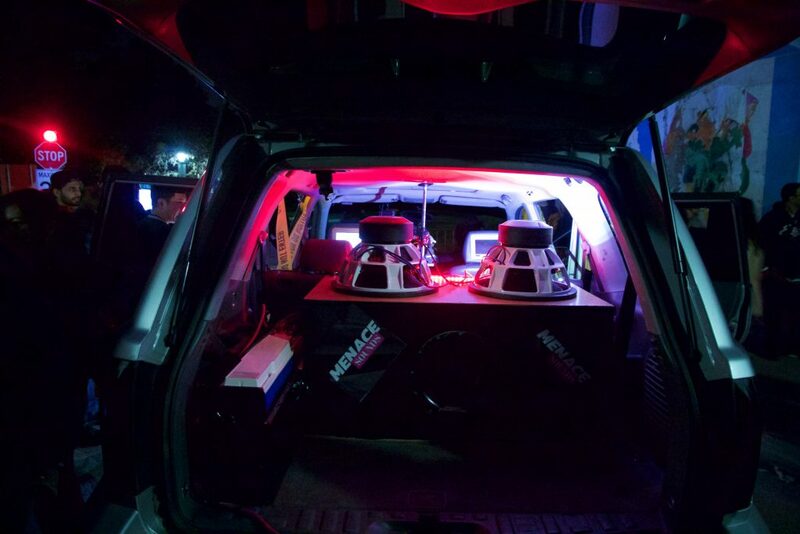 Enthusiasts of cars and souped-up sound systems come together and connect their vehicles to a central DJ console. The cars simultaneously blast the music and bass the DJ is spinning. Mangrue says that he and his friends have car meets on a regular basis, sometimes two to three times a week. “It’s a subculture for people who love souped-up vehicles. It brings a lot of people together because when I pass someone on the road and see them driving I might say that I would never speak to that guy but if he comes to a meet we would end up being best friends afterwards. It connects people and brings different cultures together. No matter where you’re from or what your background is people love cars,” says Mangrue. Salim Mangrue inside his Nissan. The acoustics of the bridge brings together an audience of people entranced by the bass. A community is formed and a party rages until the early morning. 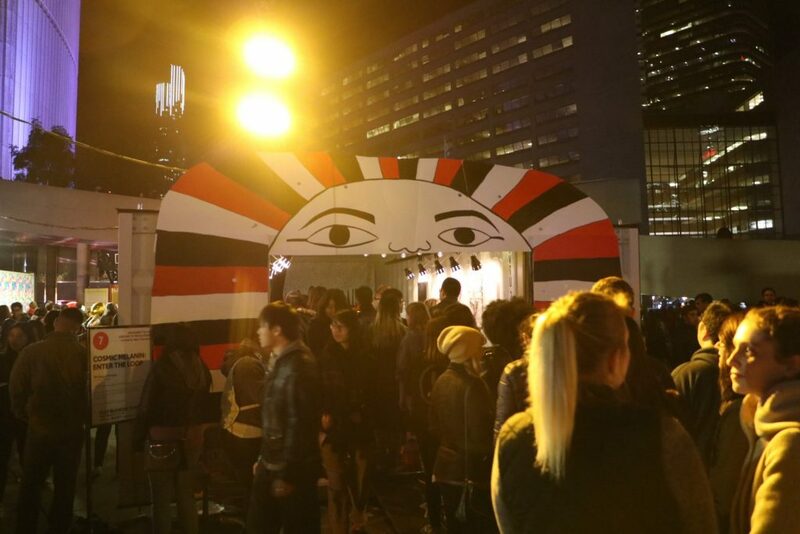 Nathan Phillips Square was transformed into a small town centre of shipping containers and signs during Nuit Blanche this year. 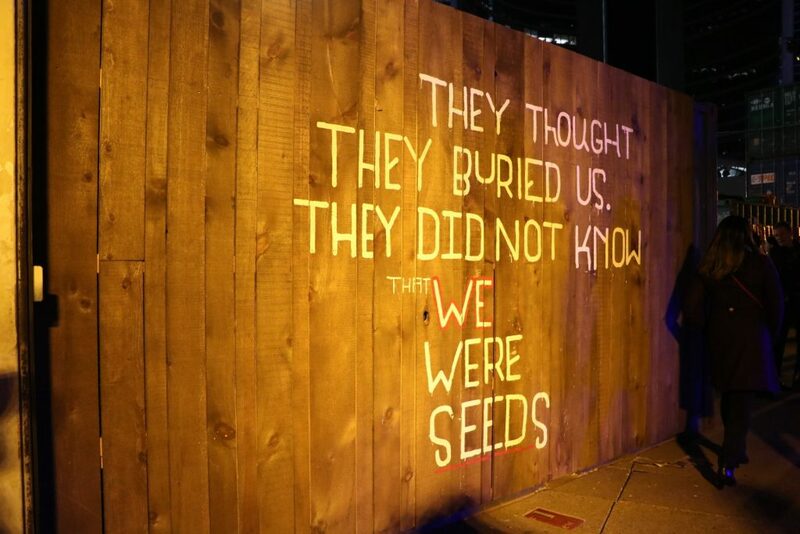 This art installation focused on bringing global injustices to the public attention through the use of art. Out of these exhibits some stood out from the rest. Enter the Loop was a 12-hour event that featured music, performances and visual arts, focused around the goal of giving local artists a platform to perform on and breaking down the stigma around urban artists. For 12 hours local urban artists such as Tee Ferguson and Above Top Secret performed for festival goers. The performances focused around issues such as inner city living and the bad reputation that is sometimes linked to it. 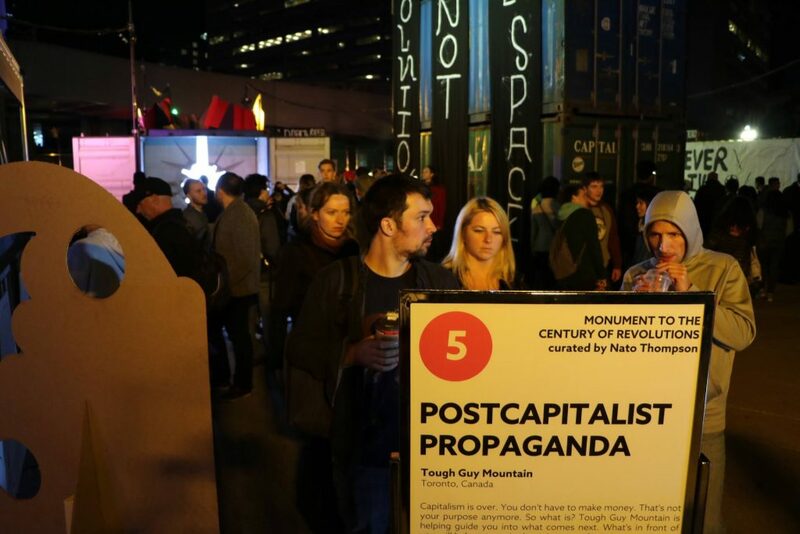 Crowd gathered around Post-Capitalist Propaganda. More now than ever people are worried about the fall of capitalism and what that could mean for the country. Tough Guy Mountain puts on an art installation that focuses on inequality in our modern society, covering issues such as racism, sexism and misogyny. Focusing heavily on the art side with some interactive art videos to express their point, Tough Guy Mountain aims to show the viewers what they call the hideous truth about capitalism. Showing how sexism and racism are focal points that parts of society are built on and how they need to change. This feature ends with talk about how society would end if people would put their creed second to others. A few symbols from Colour Revolutions. Throughout history revolutions have taken on symbols to represent their revolution, this art installation showed those symbols alongside the revolution they were used in . While showing the various symbolism other revolutions carried with them, this feature also gave information surrounding the revolutions. With the information given about these revolutions was information on what changed in the society’s following the revolutions. This information was used to show how the masses can promote change and the effects it may have. While more simple in nature than many of the other features this one was important to the installation as a whole. Being placed as soon as you walk into Nathan Phillips Square and showing you what all the other features are about. The artist shows the infamous Cuban revolution in the 50’s through unique art and perspective through the use of art and items from the time. This art feature shows Fidel Castro and Ernesto Guevara both as prominent figures in the Cuban Revolution while focusing on the lesser known Guevara and how he was influential to the cause, from being a Guerrilla war expert, author and revolutionary. 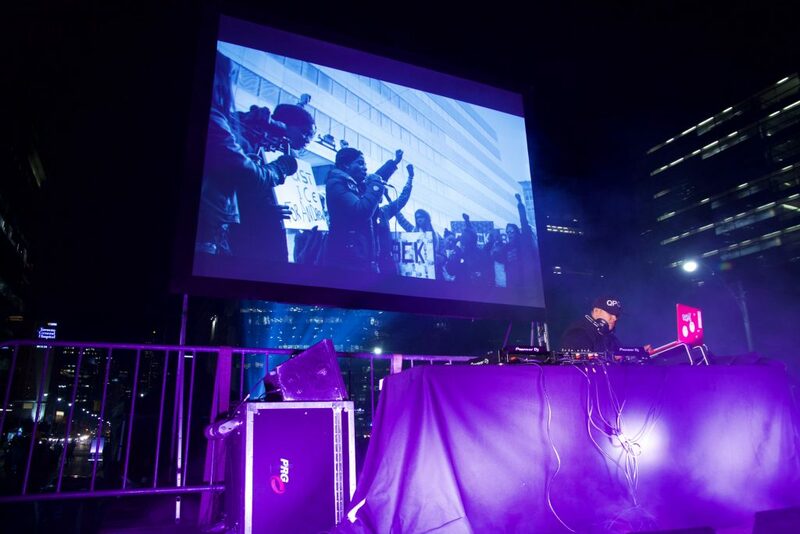 Both Queen’s Park and Nathan Phillips Square were highlights of this years Nuit Blanche, with a large focus on the community and coming together.